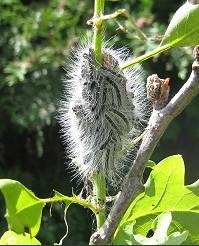 You are here: Home > Blog > Flora & Fauna > Oak Processionary Moth – a UK health threat? The eggs of the Oak Processionary Moth (OPM) have just hatched into tiny caterpillars (mid to late April). These caterpillars go around in gangs of about 200 eating oak leaves and they follow each other in long columns - hence the name which is also in the Latin version, Thaumetopoea processionea. As they become bigger their hairs cause a health threat to humans and animals because the hairs are both barbed and poisonous and they can cause nasty rashes on contact. Some people have allergic reactions to the hairs and can experience breathing difficulties and sore eyes and throats. The spread of the moth is worrying both foresters and some health experts in the UK. The moth originates from Southern Europe and has moved northwards with serious consequences. In Holland, for example, there are places where children have to wear protective paper suits to get into and out of their schools at certain times of year. Sweden and Germany are also affected and are taking measures to combat this moth. Once the caterpillars reach a certain size they form nests about the size of tennis balls where they pupate. After emerging as moths, they can spread the pest by flying to nearby oak trees to lay their eggs which are hard to spot. These remain over winter until the Spring, when they hatch and the cycle begins again. Fortunately, even though the male moth can travel up to 20 miles the female , if she is laden with eggs, appears to travel only about one mile. Often there is a population explosion 5 or 7 years after the introduction of the OPM and it is this which experts fear could make the problem much worse. Despite the recent cold winter, the eggs appear this year to be hatching normally. One badly affected site is Kew Gardens on the outskirts of London where the OPM has become well established. Tony Kirkham, head of arboriculture at the Royal Botanical Gardens at Kew says that he has worked with spraying the caterpillars and vacuuming the nests but still has not been able to eradicate the moth. Indeed the moth is established in several London Boroughs and there are suggestions that because of the risks to the general public the Government may allocate some of its health budget to control the OPM. The small woodland owner is unlikely to be affected unless their woodland is in one of the London boroughs of Brent, Ealing, Hounslow or Richmond. In these boroughs if you know the OPM is present where you are visiting, you should avoid having picnics under oak trees and certainly don't touch the hairy caterpillars. It may be that a natural predator can be introduced but these are likely to have to be imported from Southern Europe.